I wanted to help publicise this event. So I got my colleague, Haryani (we affectionately call her Hani), to share more about the ACF 2009. Hani's one of the key members in the organising committee. The ACF is organised by the Public Libraries Singapore. My name is Haryani and I am the Programmes Executive with the National Library Board. The much-awaited school holidays are coming and I am über excited! For the past ten years, the library has been celebrating the school holidays with Asian Children's Festival (ACF). This year, the Festival runs from 21 - 29 November and the main event, KidsASIA! will take place from 21-22 November (10.30 am to 6.00 pm) at the Plaza, National Library Building. 2009 marks the tenth anniversary of ACF and we are BIGGER, BOLDER and BETTER this year! Kids can expect lots of exciting activities from ACF this year. For a start, we have designated four exciting zones, namely, "Kids Play", "Kids Create", "Kids Groove" and "Kids Chill and Read". In "Kids Play", there are Wii games, sports games like archery, kangoo jump and sports chanbara. In "Kids Create", children can sign up to make a sushi, decorate a cookie, paint and many more! All these programmes and workshops are free of charge too! There will also be a showcase of talented children singing, dancing or performing tricks at our "Kids Groove" zone. Last but not least, we have got storytellers at our "Kids Chill & Read" zone to regale children with stories and more stories. I plan to bring my nephew and nieces over to enjoy all these activities. Plus, what’s totally new this year is that we have got segments for parents too. There will be advisories and clinics for parents to sample and on 22 November (Sunday), there are also two educational workshops for parents. What are you waiting for? Come on down with your families and join us at our biggest ACF ever! 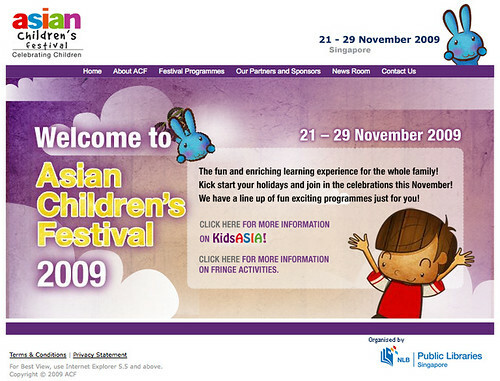 For more information, log on to asianchildrenfest.com or pick up our Go Kids from our public libraries. So did you realise the ACF started 10 years ago in 1999? May there be 10 more good solid years to the ACF. May I know if we can pre-register for the workshops now or we can only do the registration on that day itself? For the workshops at the 4 zones, registration is on the day itself. First registration starts at 10.30am and subsequently 1 hour before each workshops. Sounds like it will be a great event! We will help spread the word by posting about it on our blog too! The "Asian Children's Festival 2009" pre-register and long queue by family and kids the whole 2 days on 21-22 Nov, 2009 non-stop fall all our programmes. The beginning, middle and ending..last day is 22 Nov, 2009.